With the horrible cold long winters’ nights I like to turn to spicy recipes to warm from the inside as well as out as they cook on the stove or an excuse to put the oven on. This recipe from the Caribbean, courtesy of Levi Roots, fits the bill perfectly. Wouldn’t life be so boring without these exotic spices that can transport us half way around the world in one sniff, even if we haven’t been there ourselves? Even the cat, Brian, is around more and more, even if it is mostly quick stops for drying off on the bed linen or an extra portion of cat food! 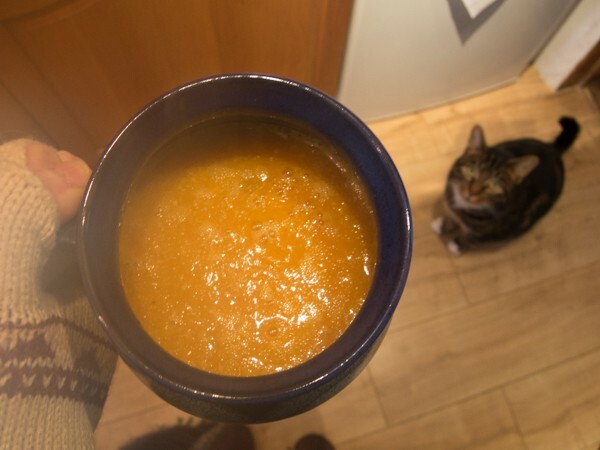 I wonder if he would like butternut squash soup? Some sad news this week though; two of the chickens were taken by a cat in the early hours of dawn at the weekend. Poor Gertrude and Mrs Speckledy and now Mrs White is all alone. I will have to get her some friends in the spring. 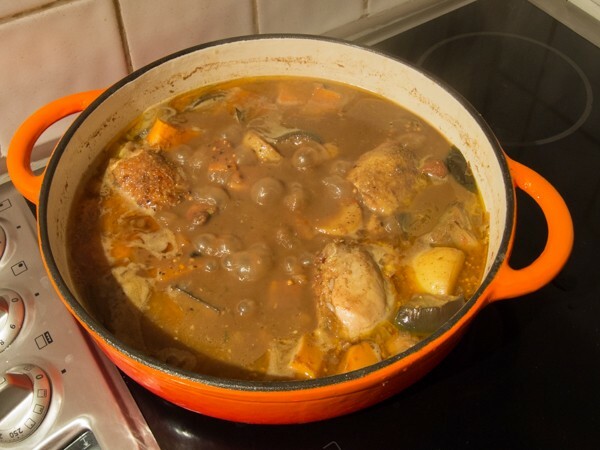 Martinique Coconut Curry by Levi Roots (Caribbean Food Made Easy) with some alterations by yours truely. Serves 4. Grind the spice mix in a mortar and pestle until a smooth paste. In a large flameproof pan, heat the oil and brown the chicken on all sides, in batches if necessary. Remove the chicken and set aside. Turn the heat down to medium and add the onions; cook until soft. Add the squash, aubergine and potato and cook until slightly softening. Now add the spice mix and stir constantly for a few minutes until the aromas are released. Add all the other main ingredients, including adding back the chicken. Bring to the boil then turn down to a simmer and cover. Cook like this for 30 minutes then remove the lid and cook for another 15 minutes to thicken the sauce. Finish with any combination of the finishing ingredients; if using the fruit, cook until the fruit is hot through. Serve with boiled rice.